Iron Stack at Oswego, Oregon. 1867. July 16 - 1954, Kenneth [Goodall?] from Elva Blackburn. Cousin. Description Likely the oldest photo of the furnace; perhaps actually 1866. Carte de visite photo mounted on cardboard; lower corners cut. See also reproductions 770b & c. Found in an envelope addressed to Theresa Truchot. The late Portland photo curator Terry Toedtemeier believed this was most likely taken by Portland photographer Truman L. Hack. 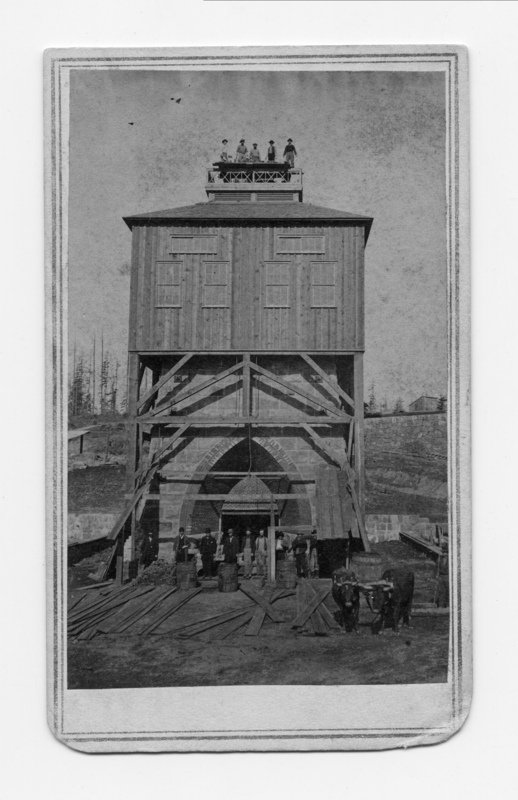 Transcription Iron Stack at Oswego, Oregon. 1867. July 16 - 1954, Kenneth [Goodall?] from Elva Blackburn. Cousin. Physical Description H 4" x L 2 1/4"